From up above, however, you'll discover a picturesque cabin that looks like it belongs in a horror flick, or maybe a Lifetime Christmas special. Someone comes home to this. Someone comes up from the dirty city streets, kicks their shoes off, uncorks some rosé, and drinks it straight from the bottle while walking around barefoot in that fresh grass. Photographer George Steinmetz spotted this beauty while on an aerial shoot—he told us, "I did some research on-line for rooftop gardens, and this was one of the more interesting ones." Let's zoom in... is that a dining table on the porch? Make it stop. 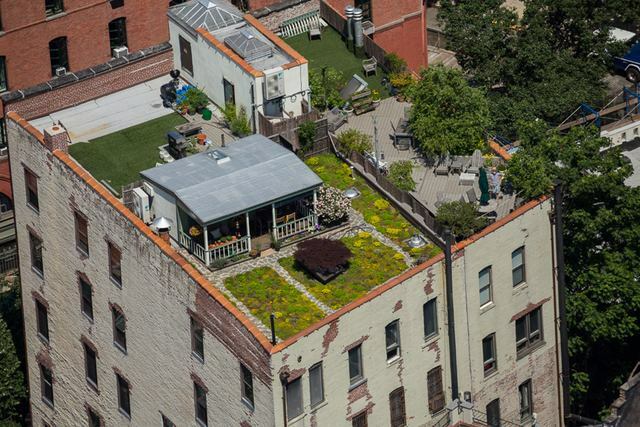 The rooftop—owned by David Puchkoff and Eileen Stukane—was explored by the NY Times. They reported back from their visit that "the porch is basically a glorified bulkhead over a hole punched in the ceiling of the family’s loft to make way for a nautical stairway that rises to a landing with a galley-like kitchenette, with two paned windows and a door that opens to the roof. Now, the couple don’t have to leave the city to hear the slam of a screen door, or watch a flock of mourning doves pecking for insects and seeds across the meadow." 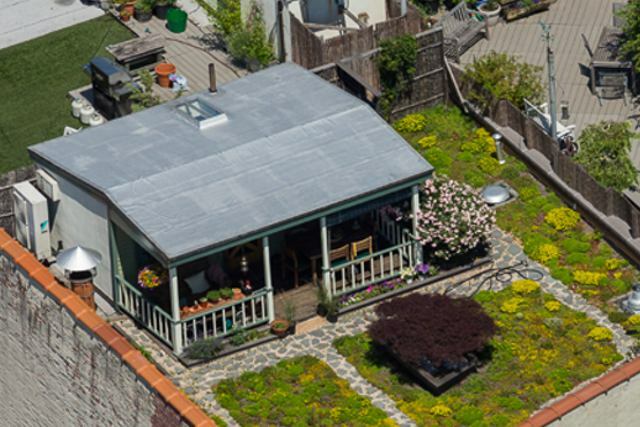 0 responses to "Some Urban Homesteader Is Living In A Bucolic Cabin On A Roof In Manhattan"